India’s Department of Telecommunications (DoT) has firmed up plans to set up a 5G test bed that will be anchored by Indian Institute of Technology (IIT), Madras, where this author presented several guest lectures in December 1990. According to a DoT official, the test bed is expected to be operational within the next six months. The Telecom Regulatory Authority of India (TRAI) too is soon expected to issue a set of recommendations to the Center that would enable companies wanting to conduct research experiments for the latest generation of mobile telephony to do so domestically. A senior TRAI official told the Indian Express newspaper that these recommendations would be a part of the suggestions on ease of doing business that the regulator is in process of issuing to the government. “We need to have an ecosystem in India itself, which is simple so that experiments can be conducted. We should have sand-boxing, and licensing for experimentation on 5G technology here. For experiment purposes, we should have a light-touch system, where if some company wants to research, it should be able to get a license to do so,” the (unnamed) official said. “If these experiments were happening here, our officials would have been training here itself instead of China. We are soon going to give recommendations to the government on this issue,” the official added. To accelerate research and development of technologies as well as specifications related to 5G, the Center has set up a high-level forum comprising officials from the DoT, the Ministry of Electronics & Information Technology, and the Department of Science & Technology, with representatives from industry and academia. 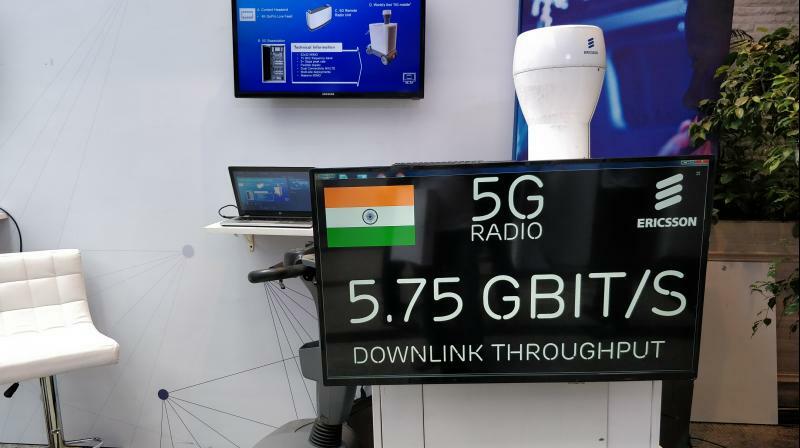 The high-level forum, set up in September, is expected to evaluate and approve roadmaps and action plans with a broader target of rolling out 5G in India by 2020, which is the aim for most global telecom companies for launch of commercial 5G services. India has traditionally been behind the curve in adoption of mobile technologies, especially in when the global standards for 3G and 4G were being set. One of the key objectives behind setting up the high-level forum on 5G was for India to be able to participate in the process being undertaken by the International Telecommunications Union (ITU) in creating standards for 5G (IMT 2020), which is expected to be a key driver of technological growth in form of artificial intelligence, internet of things, etc. The high-level forum will also work towards accelerated deployment of 5G for specific use cases in India, and these will include the development of road map related to emerging technologies, testing, and trials. It will also aim to strengthen domestic telecom equipment manufacturing necessary for the technology. As per a presentation prepared by the DoT, the targets set for the forum suggest that local manufacturers should be able to capture 50 per cent of Indian market and 10 per cent of global market over next five to seven years. The aforementioned DoT official said that the proposed 5G test bed at IIT Madras will play the role of a key enabler for research and development of domestic manufacturing of 5G equipment. Earlier in December, Ericsson demonstrated a 5.75Gbps “5G” network setup in Mumbai, India. In their live demonstration at at a trade show, the company showcased “essential technologies on the road to 5G.” One highlight was Gigabit LTE (1 GBPS download speeds) with License Assisted Access+ (LAA) technology. The LAA live demo highlighted the technology’s ability to leverage wireless network resources using higher frequency bands on a small cell architecture. Other technology innovations presented in the Ericsson showcase included advancements in Radio Network Evolution, 5G Ready Transport and Network Slicing. +License Assisted Access is a LTE feature that leverages the 5 GHz unlicensed band in combination with licensed spectrum to deliver a performance boost for mobile device users. For more on LAA, please visit here. Ericsson estimates that mobile data traffic in India will grow by 11 times by 2023. In a recently released Ericsson 5G Business Potential Report, 5G will enable a $27 billion revenue opportunity for Indian telecom operators by 2026. The largest opportunity will be seen in sectors like manufacturing, energy and utilities followed by public safety and health sectors. This will be over and above the revenue generated from traditional services which are expected to grow up to $63 billion by 2026. ITU-T Joint Coordination Activity for IMT2020 (JCA‑IMT2020) is starting a new project called the IMT-2020 standardization activity roadmap. It will be based on the information provided by ITU-T SGs and activities outside of ITU-T. It is available from the JCA-IMT2020 website. Editor’s Note: As we’ve noted many times in these techblog posts, ITU-R WP5D has overall responsibility for the IMT 2020 standards, to be completed in late 2020. IMT 2020 (standardized 5G) will not just be an extension of 4G. In addition to offering increased bandwidth and capacity, as was the focus in previous wireless generations, 5G will provide very low latency, high density and high reliability. These capabilities will enable a variety of use cases, facilitating the creation of new, predominantly business focused services. The objective of the roadmap is to support IMT-2020 standardization coordination. IMT-2020 is an important topic for the telecommunications industry, and many standardization-related activities are held in various entities. The JCA is progressing this work in a form of roadmap of IMT2020 standardization. JCA-IMT2020 will keep updating this roadmap, and therefore we solicit your information about updates. If you send us the latest information of your activity related to 5G as well as Network Function Virtualization (NFV), programmable networks, self-managed networks, slicing (including orchestration and capability exposure), fixed-mobile convergence (FMC) and Information-Centric Networking (ICN) and elaborations that are strongly related to IMT‑2020, we will reflect it in the next version, which will be published after the next JCA‑IMT2020 meeting. ITU-T member organizations may submit updates using the template to be found in Appendix below. In addition, we invite the representatives of the ITU-T Study Groups, SDOs, fora to nominate a representative to this group. JCA-IMT2020 will meet next time in Geneva on 10 November 2017, 16:00 -17:30 during the next ITU-T SG13 meeting. The Focus Group on network aspects of IMT-2020 was established in May 2015 to analyse how emerging 5G technologies will interact in future networks as a preliminary study into the networking innovations required to support the development of 5G systems. The group took an ecosystem view of 5G research of development and published the analysis in a Report to its parent group, ITU-T Study Group 13​. The FG was terminated in December 2016 having completed it’s work. AT&T and KT to work together on 5G, NFV & SDN; Consortium of 5G Carriers Forming? According to Business Korea, AT&T Chief Strategy Officer John Donovan met with Lee Dong-myeon, director of the KT (Korea Telecom) Technology Convergence Center to discuss plans for the well respected telcos to share AT&T’s NFV and SDN work and KT’s efforts around 5G. AT&T is expected to cooperate with KT in many new technologies, especially their own version of SDN/NFV and 5G. KT is leading the 5G technology development (along with SK Telecom) and is prepared to share that with AT&T. “We expect that cooperation through AT&T’s SDN/NFV leadership and KT’s 5G leadership will create synergies to solve challenges of the telecom industry in the future,” said Mr. Lee. Is an unofficial consortium of 5G carriers in the works? It appears so, despite each one has their own proprietary spec for the 5G Radio Access Network/air interface, which won’t be standardized by ITU-R till the end of 2020. Korea Telecom (KT) is not working exclusively with AT&T on 5G development; it is also collaborating with Verizon and even managed to show the fruits of their labor recently when the world’s first hologram call was completed over a test 5G connection with Verizon’s help. Verizon, meanwhile, managed to achieve a 1.6Gbps live wireless network in a field test at the recent Indy 500 event in Indianapolis. This sort of globetrotting approach seems to be defining the development of 5G. Worldwide players like Nokia and Ericsson are signing early 5G development, testing, and deployment deals with carriers worldwide. SDxCentral noted that AT&T cited an announcement last year to work with several companies on speeding 5G deployments. Companies named included China Mobile, Deutsche Telekom, Ericsson, Huawei, Intel, KDDI, LG, Nokia, NTT DoCoMo, Qualcomm, Samsung, SK Telecom, Telstra, and Vodafone. AT&T has been one of the telecommunication industry’s most aggressive operators in terms of network virtualization plans. The carrier said it virtualized 34 percent of its network functions by the end of 2016, is on track to hit its year-end 2017 goal of 55 percent virtualization, and could exceed its previous guidance of 75 percent control by 2020. AT&T plans to launch commercial 5G services by late 2018. The mega carrier said this April, it will launch 5G network trials in more than 20 markets by year-end 2017. As we’ve repeatedly noted, that’s well in advance of the ITU-R WP 5D standards on IMT 2020, which will be completed by year-end 2020. See Addendum below for a quick peek at the ITU-R WP 5D meeting, being held this week and next at Niagra Falls, Canada. KT has said it plans to launch commercial 5G services by 2019. The country’s operators are expected to support 5G trial services connected with the 2018 Winter Olympics scheduled for Pyeongchang, South Korea. KT earlier this year made an agreement with Verizon to test interoperability of their respective network orchestration platforms. KT said the agreement included the expansion of their geographical coverage areas by having the Verizon orchestrator interoperate with the KT orchestrator. During the testing, KT said they were able to create a secure connection between the orchestrators, and instantiated a virtual firewall for each side through the NFV orchestration federation. The feasibility of the orchestrator federation was tested and verified. Verizon is also working with KT on 5G technology through its Open Trial Specification Alliance. Verizon has said it views NFV and SDN as foundational to its 5G plans. The carrier is currently trialing 5G services in a handful of markets, with plans for a commercial launch by late 2018. Cisco recently released results of a survey of service providers that showed “agility” as the top driver for their NFV and SDN deployments. That need for agility was touted in a separate report by Technology Business Research as a key factor for launching new services as the telecom industry moves towards 5G deployments (mostly in advance of the official 5G/IMT 2020 standards from ITU-R WP 5D. 5G deployments will involve much more than the Radio Access Network (RAN) and will include various types of NFV, SDN, Network Orchestrator functionality. It is in that area that carriers collaboration appears to be focused, because each one has their own proprietary RAN spec for 5G deployment well in advance of the 5G/IMT 2020 standard from ITU-R WP 5D in late 2020. Please refer to the Addendum for a snapshot of the current ITU-R WP5D meeting. The Chairman of ITU-R WP5D is Mr Stephen Blust of AT&T. There’s one or more U.S. delegates from these companies/government agencies: AT&T, Verizon, Sprint, Dish Network, Echo Star/Hughes Network Systems, NTIA, Intel, Apple, Cisco, NASA, FCC, U.S. Dept of Commerce, U.S. State Dept. The most delegates appear to be from China. Many sub working groups (SWGs) will meet, including: SWGs on Frequency Arrangements, IMT-Specifications, IMT-AV, Usage, Coordination, Radio Aspects, Evaluation, Spectrum Aspects, and many others. These SWGs are under various Working Groups (WGs), including: General Aspects, Spectrum Aspects, Technical Aspects. Reference: A 23 Feb 2017 draft report on “Minimum requirements related to technical performance for IMT-2020 radio interface(s)” can be downloaded here. It was described in this techblog post. The WP5D closing plenary session will be held on Wednesday afternoon 21 June 2017. There will be an ITU-R WP 5D Workshop on IMT-2020 terrestrial radio interfaces on 4 October 2017, 9:00-17:00 hours in Munich, Germany. It’s coincident with the next WP 5D meeting and those attending do not need to register separately for the workshop. Others do. Registration info to be provided at a later date.